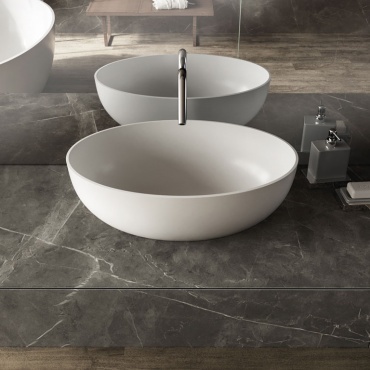 An intense, deep and compact gray, traversed by lighter, contrasting veining that adds elegance to the surface. Grey Stone responds to the needs of contemporary living with captivating and functional slabs (available in 3 thicknesses: 6, 12, 20 mm). Slabs sized 162x324 cm in porcelain stoneware with a gray marble effect. Grey Stone is available in a silk finish and slabs can be used both indoors and outdoors. The ideal covering for kitchen worktops, islands, drawers, doors and backsplashes, tables, bathroom vanity units and restaurant and bar counters. Grey Stone Habitat: Grey Stone slabs with silk finish are paired with Arbor Tobacco by Atlas Concorde for the floors. These products are complemented by original objects and accessories that furnish the bathroom with style.